Where can I start from? A week sick in bed, a week of post-recovery and so much has taken place in my city. In this city there is no time to get sick, being indoors for seven days you realize how much your missing from the outside world. ** I have chosen to write to you about the simplest of these things, but I hope you realize the depth of meaning behind this story. I went to a place I had never been before, and it was another one of those experiences that is added to my list of ‘most treasured times’. I had heard about the Langa bazaar for a while now, so I thought I will go and do a little report for the paper. Little did I know I will make a great new friend—elderly woman of course! We just click I don’t know how or why— who taught me so much about life. She was one of those Kurds who can smile and her eyes can tell you so many stories just by the way that they shine. 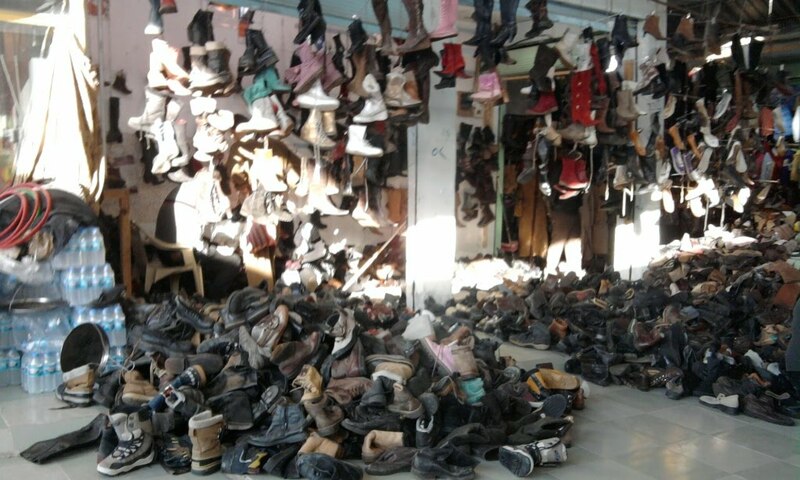 Above: Piles and piles of shoes in the Langa bazaar. No sizes, just one of each pair. My original hypothesis was correct: secondhand shops, people, shop owners and KURDS then there must be a story somewhere, something out of the ordinary and something interesting. I was right. Although this kind of goes under another larger hypothesis that I have made and have proven right over and over again: where there is a Kurd, there is a story! Simple. 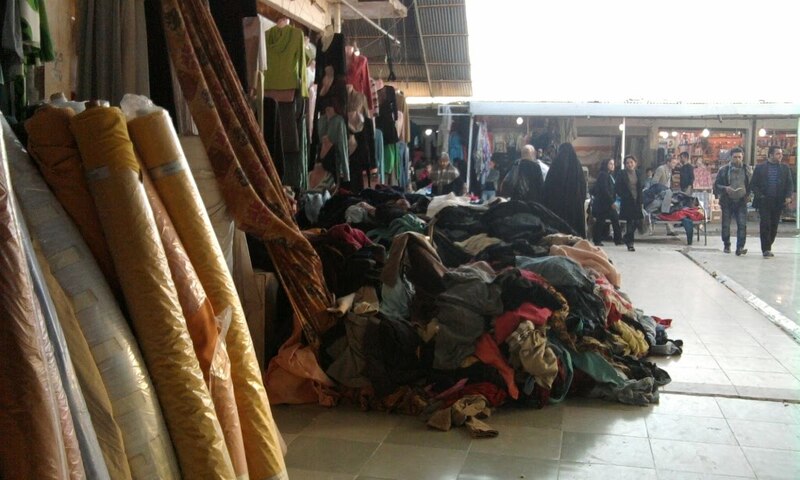 From all the shops and all the piles of clothing and all the millions of shoes, jewelry and handbags I found myself sitting on the ground next to Pla (here is the story: it actually means aunty, but people from Hawler basically use it to describe any elderly lady, where Xan somehow appears to be inappropriate. In other words Pla is basically a polite word to use before the elderly woman’s name) so… where were we? Oh Yes, let me introduce you to Aisha Ismail. That is, Pla Aisha! 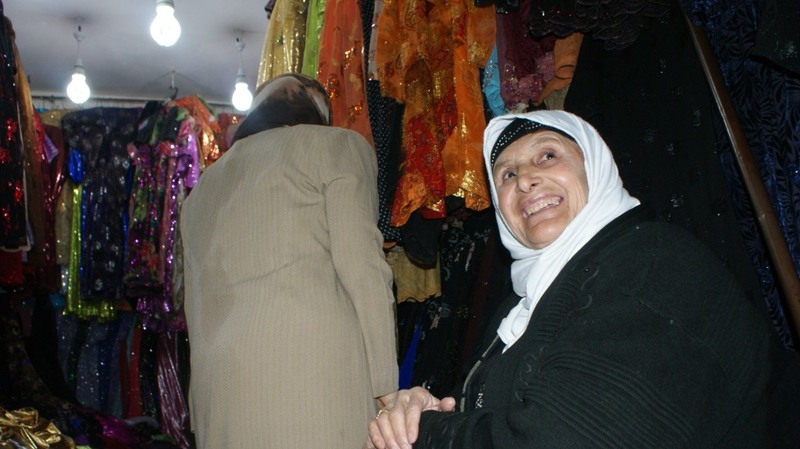 There I was sitting next to a little old lady in her secondhand shop selling Jli Kurdi (Kurdish traditional clothes) and other little bits and pieces (believe me there are a lot of bits and pieces that go with the women’s Jli Kurdi) that is what she makes her living out of. Pla Aisha pays 200, 000 Iraq Dinars (about $170,00) a month for rent in her little rectangular shop. The shop is bright, colorful, and is filled with a vibrant atmosphere of love. It doesn’t feel like a secondhand shop, but rather a secondhand love shop. 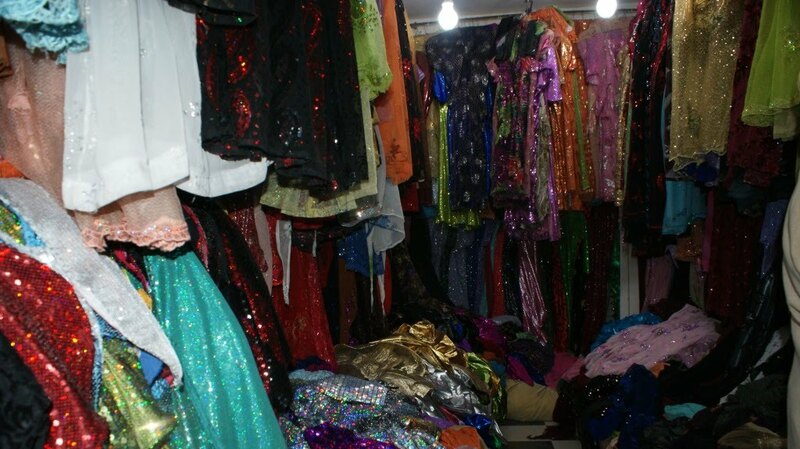 You sense the love gone into the making of each of the Kurdish clothing, just by touching them you realize that each one has been worn in moments of happiness, each has been bought, designed and sewn specially for times of happiness. And here they are, hanging on top of each other covering the walls of Pla Aisha’s little shop. The boxes on the perimeter of the shop overflow with Jli Kurdi dresses and accessories. In that colorful shop, sits the smiling lady at the entrance. Ask her for prices and she smiles, ‘amayan yakokaya,” you point at another box and she smiles again, “seyoka!” the box next to it? “duwoka” she spoils her numbers and prices. Pla Aisha is the only female shop owner there, she tells me that she doesn’t want to go around begging for money, and the shop is enough for her to make a living. I can tell she likes her job, it is clear from the way she speaks, and the way she treats her customers. She is always smiling and her shop functions on two rules: 1) you take something you don’t return it 2) you pay the money and then you take your purchase, not the other way around. Other than that she is a great help to the customers, sitting on the plastic chair at the shops entrance. I couldn’t resist but give her a warm hug. She might be doing this for her living, but I see that she is doing something for this nation. She is selling Jli Kurdi, even though they are secondhand, each of the pieces of colorful clothes is a small piece of love. Above: Pla Aisha, just watch her smile, like she’s the queen of the world in her little shop. Pla Aisha proves to me the strength of Kurdish women. “No one bothers me!” she tells me, as I sit on the ground next to her, pausing every now and then as she answers customers’ inquiries this woman is a role model to me. She comes to work after 7 in the morning until the early evening hours, in a male dominated society (or market place) she is respected by every single shop owner and loved by all her customers. A simple woman, with a simple job, but her place in my heart is by no means small. While I am at it, the Langa bazaar is where people sell bales of secondhand clothing, household items, sheets, shoes, bags and anything else that will fit in between. Most of the goods come from charity shops and clothing banks from the European and Scandinavian countries; the poor people see it as a chance to buy their necessities at a cheap price while the wealthy members of society go as a leisure activity in buying a rare treasure while sifting through the boxes and piles. I realized at the Langa bazaar there is basically something for everyone. You may like to shop, or as I learned, it is one of those places where you can just walk up and down the little alleyway roads and learn. Learn about this nation, about the culture, about the people, learn about the way of life. Learn about life itself just by walking in a secondhand market place!! 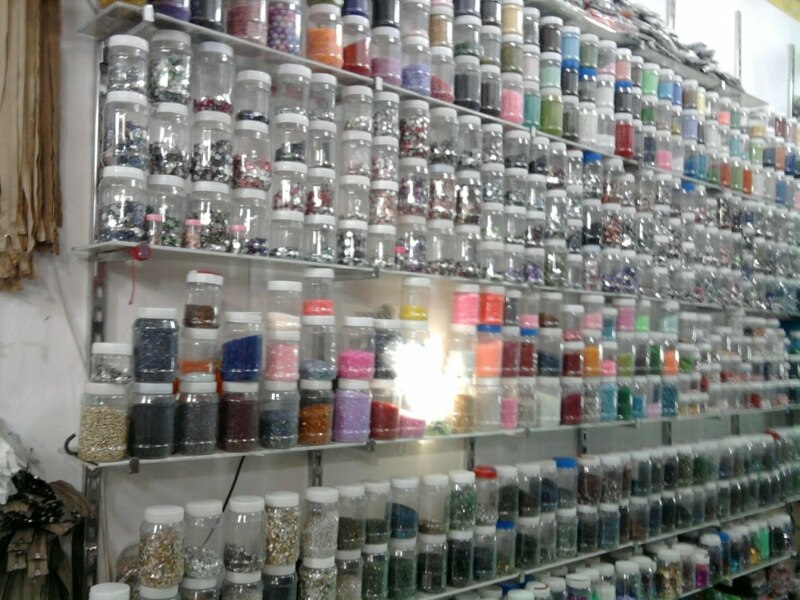 Above: Another one of the interesting shops was this bead place, for those with a hobby which includes ribbons, crafts, needles, threads and beads- this is your heaven! Next time you are in Erbil, go, walk around. And while you are there drop by at Pla Aisha’s little shop. She will be happy to have a chat with you. Don’t leave without seeing her smile. It’s L.L. – Langa Love! Pictures taken by me, for the purpose of this blog only. im gona go to erbil soon how can i find this place? I miss langa so much, if it was possible to stop-over in hawler on flights from central asia to dubai, I would fly the route just to be able to have 4 hours there every 6 months!!!!!!!!!!! !